Yet other reviewers are less impressed, calling the film “perfunctory”. “The picture is not dull, exactly, just mundane,” writes Todd McCarthy from The Hollywood Reporter. Screen Daily’s Tim Grierson expresses similar reservations, calling the film “fun and breezy but also a tad familiar” and its action sequences “sturdy but unspectacular”. Directed by indie film-making duo Anna Boden and Ryan Fleck, Captain Marvel is the 21st instalment in the series of Marvel blockbusters that began with 2008’s Iron Man. Only one of its predecessors, last year’s Ant-Man and the Wasp, has had a female superhero as a title character. The Telegraph’s Robbie Collin is not alone in remarking that 2017’s Wonder Woman – made by rival company DC Entertainment – “beat it to the punch” in having a female superhero as its main protagonist. Several critics express admiration at the digital effects used to enable Samuel L Jackson to play a younger version of the Nick Fury character he has played in previous MCU (Marvel Cinematic Universe) features. “Jackson’s CGI facelift is hands-down the best example of digital de-aging yet seen in movies,” writes Total Film’s Matt Maytum. Metro’s Larushka Ivan-Zadeh, meanwhile, salutes the film for having “a black single mom… who also happens to be an ace fighter pilot” play a pivotal role. 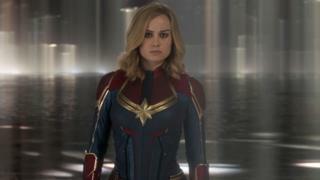 “Ultimately Captain Marvel stands both as an introduction to the MCU’s most powerful superhero and a unique bridge to even greater things,” she continues. “Best of all there is an orange cat,” writes the New York Times’ A O Scott, referring to a feline called Goose who becomes Nick Fury’s four-legged sidekick. Captain Marvel opens in the UK and US on Friday, which has been designated International Women’s Day 2019. At the risk of adding yet another middle-aged white male voice to the critical choir, I find myself in broad agreement with the opinions cited above. I spent a perfectly enjoyable two hours watching Captain Marvel on Monday. Yet I couldn’t help feeling it represented a missed opportunity. It’s probably asking too much for one of the few superhero blockbusters to have a female lead to course-correct an overwhelmingly male-dominated genre. Having cast the capable, talented and highly watchable Brie Larson as their heroine, though, I sensed the film’s makers were unsure how to capitalise on her strengths. While the film is full of amusing moments, Captain Marvel herself is almost entirely humourless. The likes of Robert Downey Jr’s Iron Man and Chris Pratt’s Star-Lord are never short of a self-deprecating quip, yet Larson is required to play things deadpan straight. She also has one of the most confusing and labyrinthine back stories this film fan has ever had the task of untangling. Much is made in the film of the remarkable powers Captain Marvel, aka Carol Danvers, has at her disposal. She can fly, shoot photon beams from her hands and even walk through walls. What she cannot do, alas, is make the makers of the Marvel movies veer sufficiently from their well-worn and highly lucrative template to give her the memorable and distinctive vehicle that she deserves. If Anna Boden and Ryan Fleck had taken half as many stylistic, tonal and narrative risks as Ryan Coogler did while making last year’s Black Panther, it could have been a very different story. What Captain Marvel proves, though, is how rarely films of Black Panther’s calibre come along – making the Academy’s recent decision not to give it its best picture award all the more regrettable.